H. Garland (active 1867-1883). Artist of 1 portrait. The eldest daughter of Christian IX of Denmark, Alexandra married Edward VII, then Prince of Wales, in 1863. Renowned for her beauty, she was stoically tactful and kind towards her husband's mistresses and endeared herself to the British people through her charity work. Until she came into the possession of the Crown Jewellery in 1901, Alexandra had a quite limited range of ornaments, most of which were her marriage jewels. 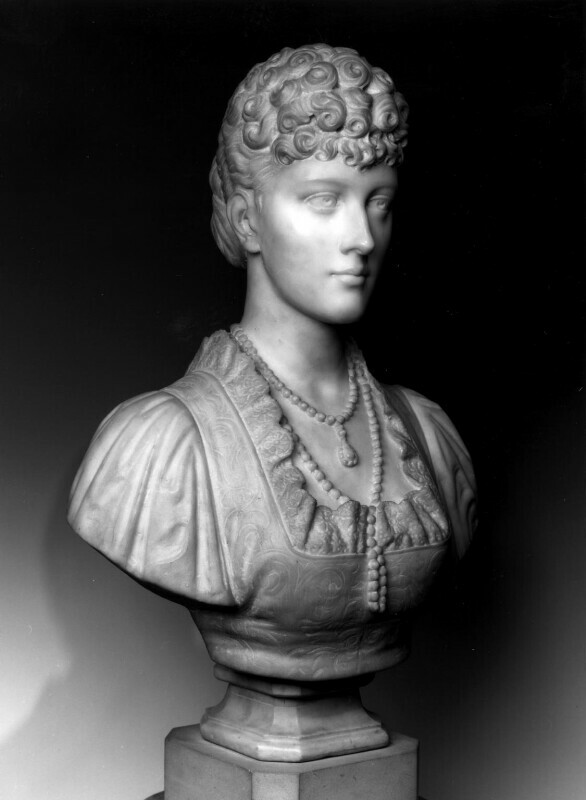 In this bust portrait she wears two strands of pearls and is similarly adorned in the portrait later painted of her by Luke Fildes. Glasgow Institute of the Fine Arts 1868 no 322 was Henry Weigall ' Portrait of HRH the Princess of Wales'. This may be the painting now owned by Gravesham Borough Council as 'Queen Alexandra'. See ArtUK website.